This will be Christof's second Vic-Maui race. In 2012 he competed on Turicum. He has done the return delivery from Maui three times both as watch captain and skipper. When not sailing offshore, Christof manages Simply Sailing School in Vancouver, BC. Outside the sailing world, Christof spends his free time with the family. This will be Dan's second Vic-Maui race. Dan sailed with the 2014 Team String Theory and in 2016 was again on String Theory's team, this time competing in the Vic-Maui race. Off the race course Dan manages a team of aerial mappers and sails his boat Palapa (Bavaria 37) with his partner Susan exploring BC's coast. Bryan joined Team String Theory at the last moment in the 2016 race. He participated in the practice races as a preparation for the return delivery and when one of the crew had to bail the day before the race, Bryan joined the team and proved to be a valuable asset to the team. Bryan owns Ann Bonnie, a sister ship to Salient and another Vic Maui veteran (2012). When not sailing Bryan devotes much time to his family and runs a successful video game company. Suze trained with Team String Theory in 2016 and crewed on the return delivery from Maui to Vancouver. Suze quickly learnt the ropes of offshore sailing and is looking forward to competing in the race for 2018. When not on the ocean Suze loves fresh powder on mountains. She lives in Whistler, close to the ski runs and manages a real estate consulting business. 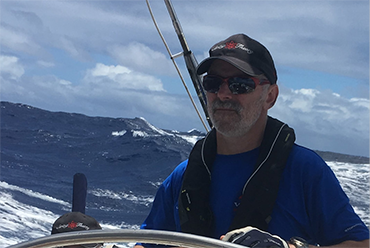 Tim completed three Vic Maui races. He first sailed to Maui on Turicum and then two more times on String Theory. In 2015 he competed in the Pac Cup and later did an Atlantic crossing. Living in landlocked Alberta did not prevent Tim from becoming a very accomplished ocean racer. Off the water Tim is a property owner, investor and developer and spends a lot of his time with the family. Renee sailed extensively in the Pacific Northwest. There is probably not a single race she has not competed in. Renee sailed on Turicum in the 2013 Van Isle 360. She proved to be an excellent sailor and with her humour was responsible for many laughs we shared in the cockpit and off the boat. When not sailing Renee works as a dentist and enjoys spending time with friends. Susan took on the tremendously important task of managing the provisioning for the Salient Racing Team. Only a well fed crew is a happy crew. On the water Susan enjoys sailing with her husband Dan on their boat Palapa. Andre is the communication liasion during the race. This will allow the race team to communicate with their families and friends at home. She will also coordinate the shore base social activities in Maui & Vancouver. Andrea enjoys cruising BC's coast together with Christof & their son Lenny. When not on the water or looking after her family, Andrea works as a visual merchandiser.